GRIM is my first foray into horror. It’s a hybrid of English low-budget Hammer-style horror, and Stephen King’s big social canvases. Needless to say I don’t compare myself in any way to these two beacons, but that’s what inspired me. Behind the net curtains of a neat seaside house, behind the chintz-covered sofa, there lies a headless body. Blood covers the ceramic figurines and framed photos, soaks into the doilies and cushion covers. The good people of Besselham, the holidaymakers, shopkeepers and schoolchildren, have no idea that this is the beginning of a wave of unexplained deaths that will strike terror into the heart of a prim, conservative community. As bodies pile up in the panic-stricken town, visiting archaeologist John Russell makes a strange and sinister discovery on the beach at low tide. An ancient monument, perhaps – or evidence of a hideous blood cult rising from the distant past to engulf Besselham? John must risk everything to save his disturbed, lonely son Isaac before insatiable powers of evil claim and consume him. 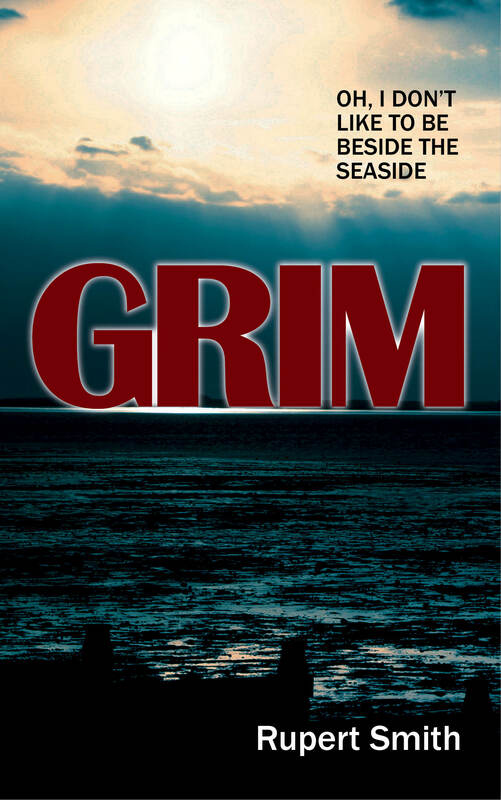 GRIM is Rupert Smith’s first venture into horror, a thundering tale of supernatural terror set amidst the caravan parks and amusement arcades of an English coastal resort.